Just in time for spring swimming season, some fabulous floats have been surfacing lately, and there's even a new floating water park opening up. The 9-foot "Party Bird Island" floats went viral a few weeks ago after Sam's Club put the $149.99 floats on sale and was featured on Live with Kelly and Ryan. The giant flamingo that seats six adults was too much to resist. How about turning your pool into a country bar with a bucking bronco? The Official PBR (that's the Professional Bull Riders association) have trotted out the Inflata-Bull Rodeo Bull Ride On Float (above). An outer ring maintains balance while you try to tame the bull. You can have it for $48.99 at Amazon. 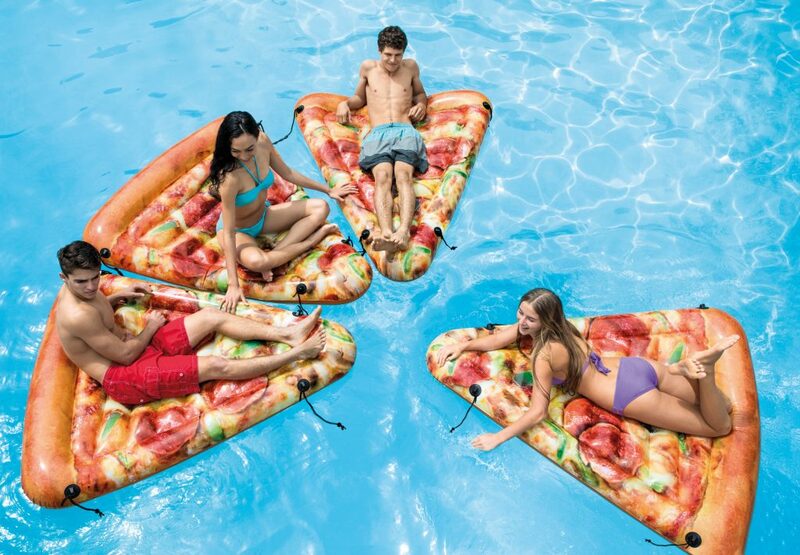 Meanwhile, Intex, the world's largest maker of inflatable products and above ground pools, has released a new line of floats made with photo realistic images and fun shapes. You can make a Pizza with your friends. Each "slice" is $14.99 and it comes with handy clips to join them together into one giant pie. You'd need eight slices to make a whole pie that's 69 inches across. You can find it at Wal-Mart. Still hungry? They also have floats that look like realistic slices of watermelon, kiwi and even popsicles. You can also float on a side of fries. An order of floating French Fries is $14.76 at Walmart and $23.97 at Amazon. While lying back with a cold drink is our top floating activity, Orlando's first inflatable water park opened for business last weekend. 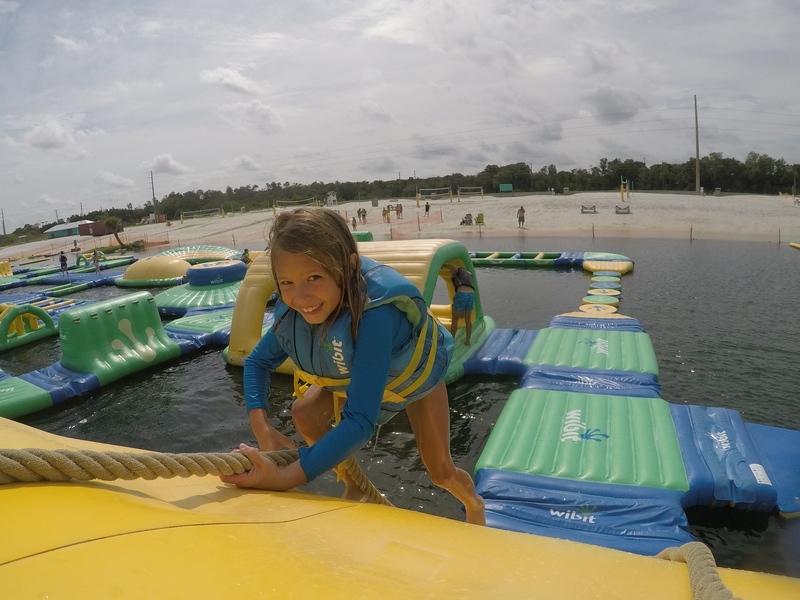 The Orlando Watersports Complex opened Saturday with floating climbing areas, slides, monkey bars and obstacle courses. Inspired by Lego blocks, the Aquapark features a modular series of interlocking climbing obstacles, pathways and slides. It is open daily from 11 a.m to 5 p.m. It's $20 for a 50-minute session or $40 for all day. Reservations are strongly recommended and you can book online here. Keep an eye out for Nona Adventure Park scheduled to open this summer in the Lake Nona area of Orlando. It will feature an inflatable, floating obstacle course, wakeboarders pulled along by cables and a 60-foot climbing tower with a ropes course. We already have some floating water parks in the Tampa Bay area including one off the beach behind the TradeWinds Resort in St. Pete Beach. It isn't open for the season yet because we are kind of wimps about cold water here in Florida. This one opened in 2011 as a 15,750 square-foot floating inflatable water park offering up to 11 water features for bathers including slides, splash zones, a bounce cave, a giant see-saw, large water loungers, splash mats, trampolines, and climbing peaks. It's $16 an hour to play at the TradeWinds water park, and you don't have to be a hotel guest to try it. Over in Pasco County, SunWest Park in Hudson has been operating for the last two years in a place that didn't have a beach of its own until the county spent $3 million to create a man-made beach, water obstacle course and a variety of activities. Sofi Laman, 8, climbs the XXL Action Tower at SunWest’s Aqua Park. Though the place is still open (and the Aquapark costs $15 for a 45-minute play session), Pasco County has been mulling the idea of taking back the park operations from its private contractor after complaints about the park upkeep. Stay tuned. By the way, if you haven't climbed onto one of these floating water parks before, be warned they are harder than they look. Some, like the TradeWinds water park, are in deeper water so there's no standing or using the ground to boost yourself up to the floating play area. And it can be a workout bouncing around.